Bond formation/cleavages which predominantly follow the two-electron "arrow pushing" formalisms (wavefunction dominated by a single configuration comprising doubly filled molecular orbitals) and which can be handled by Hartree-Fock models. If such arrow pushing results in charge separation (or its loss), then solvation models will have to be added. Bond formation/cleavages and double bond rotations, where two-electron arrow pushing is not followed (homolytic bond cleavage, asynchronous bond cleavage/rotation forming biradicals) in which the wavefunction comprises two or more electronic configurations whose relative contributions change as the reaction proceeds. These are known as multi-configuration (MCSCF) reference states. Molecular mechanics can sometimes be used for 1 above, but molecular orbital methods have to be used for the rest of these cases. The previous approach, which relied on the Hammond postulate to infer the properties of the transition state for the reaction is indirect. A better approach is to locate the actual transition state. The easiest way of doing this is to define one bond, in this case the distance between the N of a NO2+ ion and the carbon it attaches to in an aromatic ring) as a reaction coordinate, and calculate the (Quantum mechanical) energy of the system as a function of this bond length. In the schematic energy profile so obtained, point 1 shows the nitronium ion forming a weak π-π complex with the aromatic in which the ion and the aromatic are face-to-face in their relative orientation. 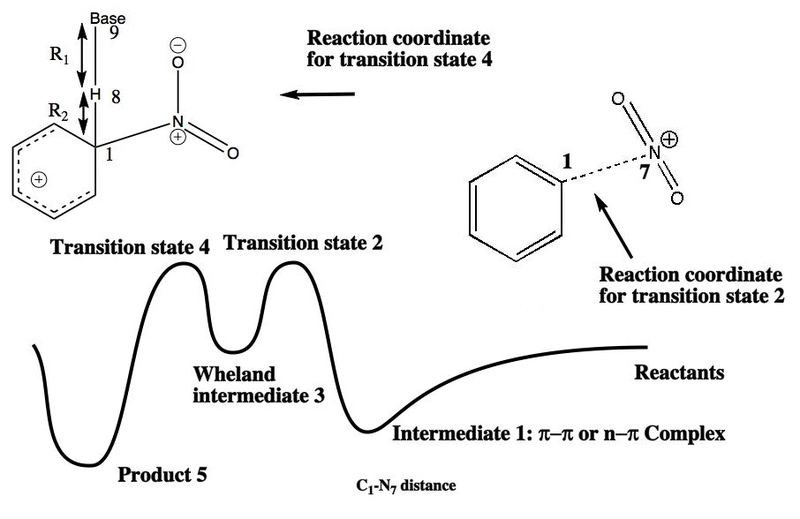 Transition state 2 is the highest in energy; point 3 represents the geometry of the "Wheland" intermediate. At this point, one has to select a different reaction coordinate, and one can now complete the the reaction via transition state 4, going to final product 5. From this reaction profile, one can select the approximate geometry of the transition 2 or 4 and use a precise algorithm such as Eigenvector Following to fully optimise its geometry. This is then subjected to a calculation of the 2nd derivatives of the energy with respect to the (3N) coordinates of the molecule. This matrix is diagonalised, and shown to have all positive roots (eigenvalues) except ONE. This is the reaction coordinate normal mode. The eigenvalue energy can be converted to a vibrational frequency, and the eigenvectors of this root of the matrix can be visualised (animated). This procedure was followed for Pyridine rather than benzene (see see DOI: 10.1021/ja021152s for details of calculations for the prototypic reaction of a nitronium ion with benzene, where less is more, i.e. this simple prototype is in fact quite complex). The reaction coordinate normal mode obtained for the transition state clearly shows the required C-N bond formation in the 3-position. Vector correspond to C-N bond formation. TS for (apparent) 4-Nitration. +4.6 kcal/mol higher. Vectors correspond to a 3- to 5- migration. The Wheland intermediate must now break down by proton removal to form the final product. This too should be studied by the transition state model, using the C-H and H-base distances as a reaction coordinate. Only then can one determine whether the C...N bond formation, the C...H bond cleavage, or a synchronous combination of both is actually the rate determining or highest energy step in the pathway. An real example of such a reaction profile is found in the mechanism of metal-catalysed ring closure as shown below. Here would involve the attack by an electrophilic carbon on the carbon of phenyl group as illustrated with the red arrow below. In this mechanism, the electrophilic C-C bond formation (TS2) is actually concurrent with the proton removal by the metal ligand (TS4), i.e. TS2 and TS4 are one and the same, and the Wheland intermediate has no existence! By combining the two steps, the molecule does its best to avoid loss of too much aromaticity, which the existence of a discrete Wheland intermdiate would imply. This involved the catalysis of the Diels-Alder reaction inside the cavity of a crystal. An interesting question to ask is how the transition state is influenced by the surrounding cavity. We can use the above approach to locate this transition state both outside and inside the cavity. Unlike the transition state for electrophilic aromatic nitration, the Diels-Alder has TWO bonds forming. The above approach could be extended by performing a two-dimensional reaction path search, varying the length of both bonds systematically to construct a 2D map. However, experience shows one can in fact adopt a short cut. It turns out that very many C-C bond forming reactions show a C-C bond length in the region 2.1-2.3Å. A good approximation is to calculate just the single point in the 2D map by restraining both forming C-C bonds to 2.2Å, whilst fully minimising all the remaining geometric variables (in practice this is done in the Gaussian program by specifying the keyword opt=modredundant and adding the two bond specifications at the end of the geometry input). In the second step, the precise values of the two C-C bonds can now be themselves optimised by the Eigenvector Following method, involving calculating the force constant (Hessian) matrix (keyword opt(calcfc,ts)). This matrix is now quite likely to have a single negative root, as a consequence of having pre-optimised the geometry with the two C-C bonds constrained, and the EF method in effect implements the constraints that the energy of the total system will be maximised by following the vectors of this single (-ve) root, whilst simultaneously minimising the energy for all the other (+ve) 3N-7 roots of the Hessian. This argument of course presupposes that BOTH bonds have a length of 2.1-2.3Å at the transition state. Whilst simple Diels-Alders are so symmetrical, the topic has been controversial in the past, and there is good reason to suppose that larger cycloadditions such as e.g. π6s + π8s may be very unsymmetrical (DOI: 10.1021/ja00768a085). 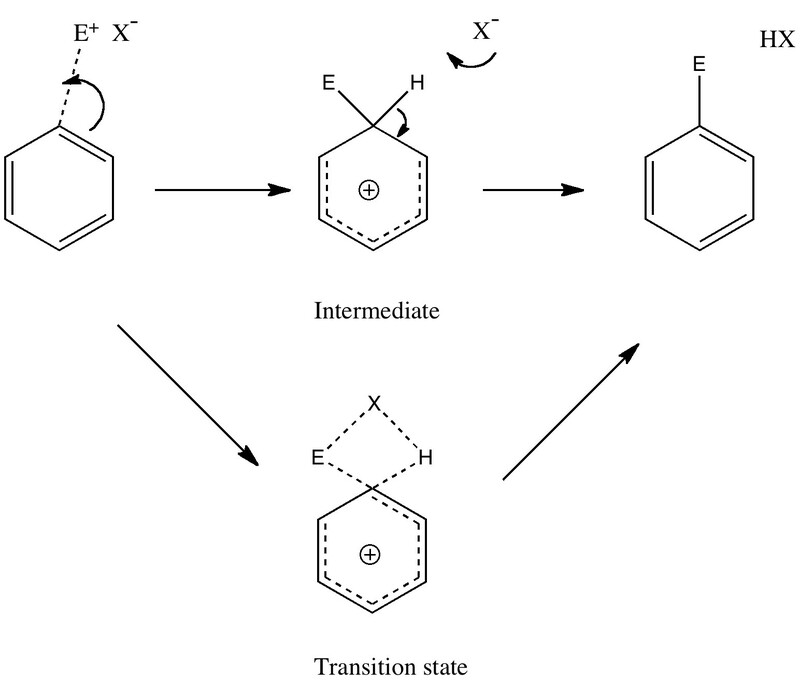 The result can be seen below for the and Diels-Alder transition states. Using Ln k/T = 23.76 – ΔG/RT and t1/2 = Ln 2/k; 20.0 kcal/mol corresponds to a half life of ~40 hour at room temperature (298K), more or less what is observed. For more details, see here. (c) H. S. Rzepa 1998-2012. No reproduction rights granted to this material without permission.